Apart from the Ray Ban Wayfarer, there is likely no more iconic piece of eyewear than aviator sunglasses. The immensely popular aviator shape was developed by non other than Bausch & Lomb (Ray-Ban) for fighter pilots back in the late 1930’s. Needless to say, they’ve become a mainstay in sunglasses fashion and recreated by just about every eyewear brand on the planet. Aviator sunglasses have since then become just as iconic on sailors – and policemen, schoolteachers, gardeners and Michael Jackson. They look just as good on women as they do on men. Actually, they look better on women, cause just about everything looks better on women (except a moustache). They probably look good on plaintiffs too. Maybe that’s why Oakley named their latest aviator creation the Oakley Plaintiff. For the last 2 weeks the folks at FloatWays have had a pair of Plaintiffs in matte black, red striped stems and OO Black Iridium Polarized lenses to test. If you recall from the Oakley Batwolf review last week, we love the OO lenses. The particular variation of the Plaintiff that we have is model number OO4057-07. If you were wondering about our sunglasses reviews for boating, we do test every single set of sunglasses we get for at least a week or two before we give our final insight. With this latest pair of Oakley Plaintiffs, it was no exception. They actually spent time on both a guy’s and a girl’s face – behind the wheel, at the dock and on a boat. At first glance, the Oakley Plaintiff Aviator Sunglasses look like a vanilla set of shades. However, there is a little bit more going on under the hood. The stem hinges are the first thing that caught our eyes when closely inspecting them. Oakley calls these hinges, titanium Mono Shock™ hinges. There is basically a small, flexible titanium (we suppose) bar that connects each hinge to the stems, instead of the stems connecting directly to the hinges like on most sunglasses. Oakley claims this helps create hyper flex, or what we would call “springy flexibility” so that the stems can grip your head a little better. We reckon this is a good thing, because like most Oakley sunglasses, the stems are nearly straight with the only curve being to hug your head rather than to hook to your ears. The Plaintiff stems have no rubber (or what Oakley calls Unobtanium) to help with grip. Interestingly enough, Oakley chose plastic, or as Oakley calls it, O-matter (don’t you love the branding of everything?) for the temples – the last bit of the stems. We would’ve loved to see a little bit of rubber, but we reckon the plastic is still better than alloy all the way back. Putting really cold alloy sunglasses on can be a little bit of a shock. At least the plastic serves as insulation. The lens shape of the Plaintiff is a bit more curved and forms more of a pocket than other more traditional aviators. We thought this was great. It allowed for a little more eye coverage than standard nearly-flat lenses that feel like they are sitting a foot away from your face. For that reason, we felt that for optical fit they are a big improvement over other aviators. The practical males in the test opted for functionality and liked the sunglasses as close to the eyes as possible – with the bridge very close to the bit between our eyes. However, the ladies kept pointing out that wearing aviators like that is uncool and dorky. So they made it a mission to make us pull them out a bit allowing us to look over the lens if we tilt our head down. Now we can also see out the sides. Not sure we like that. Oh well – women know better. The Oakley Plaintiff overlooks the marina. Look closely at the reflection on the lens. The matte black finish of the frame is impeccable. The color and texture is very sophisticated. They are also not as loud as chrome, gold or any other semi-shiny finish like gunmetal. This finish is what you would choose if you want to woo women with your awesome aviator sunglasses subtly, while they don’t realize what is the awesomeness that attracts them. Unfortunately, Oakley decided it would be a good idea to put a bright red stripe down the side of the stems. There goes subtlety out the window! We admit, we hated the red at first. We went with these because of the matte black frame and the OO Black Iridium Polarized lens, so the red stripe was the only option in this configuration. We are happy to report though that after a while we got used to the red. All is well now. The Plaintiffs look great on guys and girls, but we reckon they look better on blondes. Like all Oakley sunglasses, the lens options are all polycarbonate. You can argue that crystal gives you slightly better optics, but as active people, we are on Oakley’s side in the use of polycarbonate. We like the eye protection offered by polycarbonate and would only consider glass lenses for maybe a walk in the park – not sailing; not driving. We can only think about shattered lenses in front of airbags or swinging sail booms and that’s enough to steer us towards shatter resistant polycarbonate. Here you can see the rose tint of the Oakley OO Black Iridium Polarized lens. However, note that it doesn't look as dramatically rose as it does here when against your eyes. 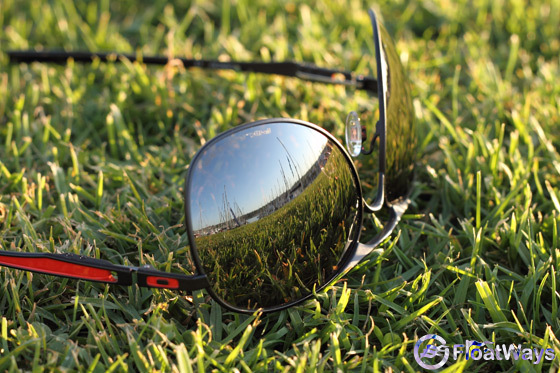 We chose polarized first and recommend polarized of course! 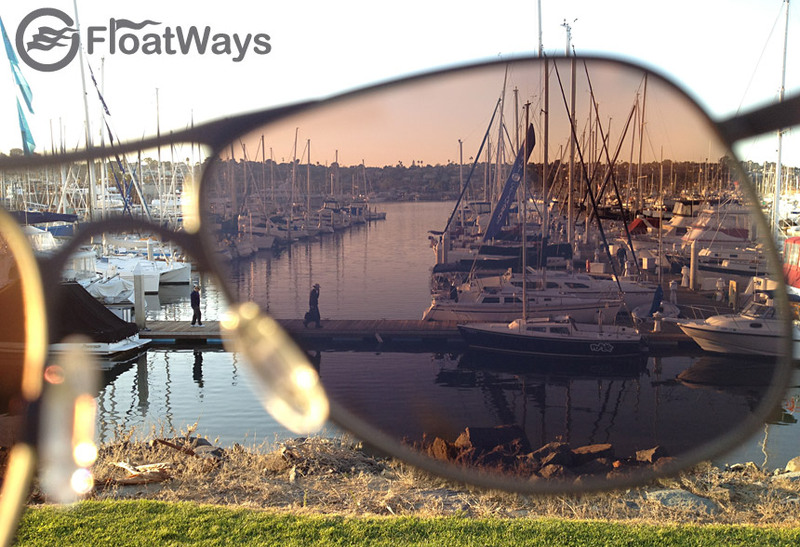 We are boat people, and polarized lenses are great over water. However, we don’t necessarily recommend the Oakley Plaintiffs for actual boating – unless it’s going to be mellow cruising stuff. The fact is, you will more than likely lose them. The hold is not like you will find in more modern shapes. They sit on your face in a very light and refined manner. The downside to this is, they can easily slip and fall off. The Plaintiffs are stylish lifestyle sunglasses. They are meant to make you look good and give you the self-esteem of Tom Cruise. Even though they are famous because aviators put them on the map, the shape is still 1930’s technology. There are way better options for function these days. We reckon aviators will agree too. The main problem with using the Plaintiffs for sailing is that they can very easily slip off. Our first boating experience with them nearly rendered them lost. So for the second outing as sailors, we wore the Oakley Plaintiffs during a 1 hour drive to a marina, before a race. The first thing we did before climbing on the boat, was switch them out for the Batwolfs – a much better choice for sailing. So why not just buy Batwolfs and forget the Plantiffs? Well, simple: In the eyes of women the Batwolfs are Transformers and the Plaintiffs are Ashton Kutcher. Gentlemen, Transformers are uncool. Maybe you’re the type that ONLY wears aviators because you are too cool to wear anything else. Well, if you are also an avid sailor we bet you’ve lost more than 1 pair. We’ll leave that up to you. The Oakley Plaintiff is one of the coolest pair of sunglasses we’ve had. But, unless it’s a lazy cruising afternoon, they are staying in the car before we board the boat.